Description: An important suite of four French Charles X period fauteuils, three of which were stamped, “J.J. WERNER”, by their maker, Jean-Jacques Werner. These fauteuils were made from ash and burl ash with flat rectangular backs ornamented with three, Wedgewood biscuit medallions. The back of each arm ends with carved lotus flowers. The front legs have an elegant console shape. The back legs are sabor-shaped legs. 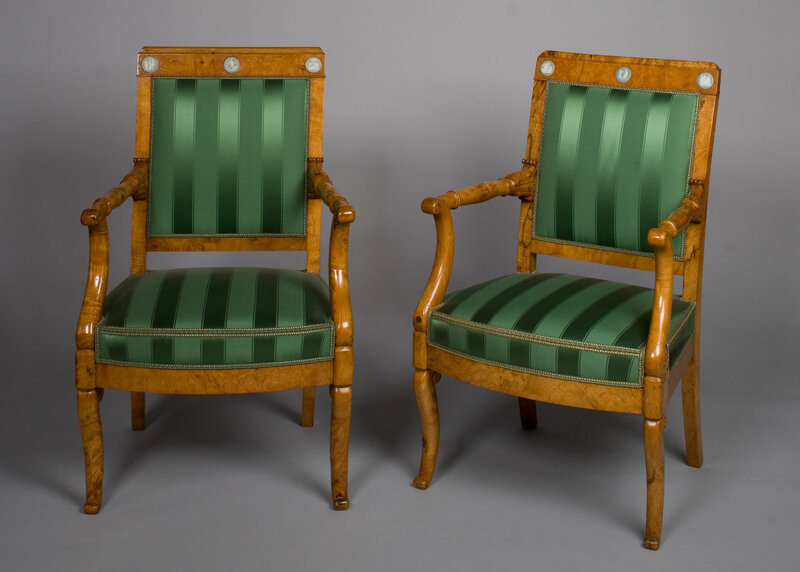 The Birmingham Museum of Art, owner of the most important collection of Wedgewood in the United States that is second only to the Victoria & Albert Museum in London, is purchasing a pair of these fauteuils from Mary Helen McCoy Fine Antiques out of the original suite of six from which these belonged. Born in Berne, Switzerland, Jean-Jacques Werner (1791-1849) is the most celebrated ébéniste of the Restauration Period. Werner, who established his business in Paris in 1812, specialized in the production of furniture made from indigenous woods. One of his greatest strengths was the exceptional quality of his choice of woods, especially ash, elm, yew, and mulberry. Werner won silver medals for his work at the Expositions of 1819, 1823, 1827, and 1834. He had many commissions from the French nobility and foreign princes, thereby receiving the title of “fournisseur et décorateur de sa maison” to the King of Bavaria. He never won the gold medal and insisted there was a conspiracy amongst his rivals. Regardless of his concerns, he was much appreciated by the French court. A number of Werner’s works are in private collections and among museums such as the Musée des Arts Décoratifs, the Musée de Château de Versailles, Grand Trianon, and the Palais Lenchtenberg in Munich.